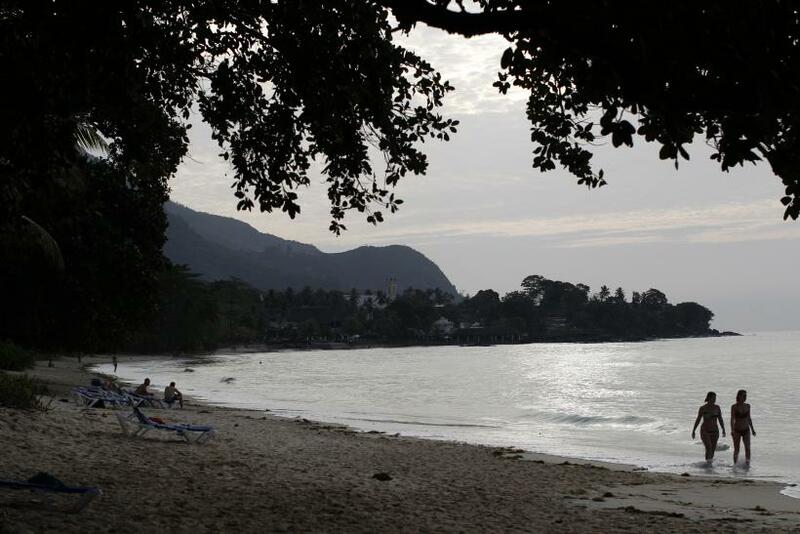 People walk along the beach in Seychelles February 29, 2012. A brand new wind turbine farm was launched this week in the Seychelles, an archipelago off the east coast of Africa, with funding from the United Arab Emirates. The project links a pair of strange bedfellows: One is an oil-rich Persian Gulf state of 8 million ruled by a dynastic monarchy, and the other is a democratically governed island nation of 86,000 where tropical beaches and hotels lure more than 200,000 well-heeled tourists every year. Both countries stand to benefit from the energy project -- but for very different reasons. The Seychelles will get closer to its goal of generating 15 percent of its power from renewable sources by 2030, while the United Arab Emirates will progress in its plans to corner the market for green energy. But for the Seychelles, the stakes are much higher, and this project is at once encouraging and woefully inadequate. The environmental threats facing the archipelago are not just economical; they are existential. And unless countries around the world embrace sustainable energy projects, the islands are at risk of going under. The six-megawatt Port Victoria Wind Farm was funded by an $8.7 million grant from the Abu Dhabi Fund for Development, a government entity. A company called Masdar, itself a subsidiary of the UAE monarchy’s own Mubadala Development Company, installed the facility. The project is expected to generate enough power for more than 2,000 homes in the Seychelles. It uses eight turbines on two islands and required the installation of underwater cables. This is a boon for the Seychelles, which lie a thousand miles east of the coast of Africa and north of Madagascar in the Indian Ocean. Africa has felt the ill effects of climate change more keenly than the rest of the world. The continent has warmed by approximately 1 degree Fahrenheit over the last century, which is faster than the global average. Temperatures could rise another six degrees by the end of this century, according to estimates from the Intergovernmental Panel on Climate Change. The Seychelles in particular are suffering harsher dry spells, along with increasingly strong storms during the rainy season. The climatological turmoil threatens not only the archipelago’s uniquely diverse flora and fauna; it also puts human populations at risk of property damage, drought and unpredictable agricultural output. Realistically speaking, there is little the Seychelles population can do to reverse these alarming trends. The country does have room to cut back its carbon emissions; it relies heavily on diesel fuel for power, and hydrocarbons account for about one-fourth of all imports. But the archipelago is so small that major domestic changes would hardly make a dent in emission totals worldwide. The Seychelles is responsible for less than 0.01 percent of global carbon emissions and can do little about industrialized powerhouses like China and the United States, which together emit more than 40 percent. But the Seychelles can benefit economically from sustainable energy projects, which will decrease the country’s vulnerability to oil price fluctuation. The wind turbines might also help to boost the archipelago’s image internationally, which is of utmost importance to a country that relies on tourism for one-fourth of total GDP. The wind farm project could actually hurt revenues for the United Arab Emirates, which is the second largest exporter of hydrocarbons to the Seychelles after Saudi Arabia. The wind turbines will lessen the archipelago’s demand by generating enough power to fuel 8 percent of electricity consumed on Mahe, the most populated island in the Seychelles. But for the UAE, this won’t make much of a dent. Seychelles imports from the country were worth $114 million in 2011, a tiny portion of the total $285 billion in goods exported by the Middle Eastern country during the same year. What the UAE has to gain by funding the project has more to do with research than with immediate profit. This highlights the UAE’s unique paradox; it is a country at the forefront of green energy innovation, and yet its revenues come almost entirely from hydrocarbon production. The UAE is in no way a good model for sustainable living. Carbon dioxide emissions per capita soared to 22.6 metric tons in 2009, the last year on record with the World Bank. That’s higher than any Western country; the U.S. figure was 17.3 metric tons. The UAE also heavily subsidizes hydrocarbons for its own population, a program that has been widely panned as economically unsustainable. But political concerns keep the subsidies in place; recent Arab Spring revolutions in the region have alarmed public officials in the UAE, a federation of seven monarchies in which average citizens have little say in the policies that govern their daily lives. Generous government spending has so far worked to curb any revolutionary impulses, and the kingdom would prefer not to rock the boat. The very wealth that keeps a lid on dissent also enables the UAE to pour money into green energy projects. These investments aren’t yielding much by way of revenues -- at least, not yet -- but they work wonders for the country’s international reputation, attracting some of the world’s best and brightest to study and work in the small Gulf state. On that day when green energy becomes an easily profitable field, the UAE will already be years ahead of the game in terms of connections, experience and influence. That could explain the country’s rather generous impulses of late; the Seychelles is not the only country to benefit from UAE largesse, which is typically delivered in the form of grants, capital or concessionary loans. Masdar was behind the launch of a 15MW solar power installation in the West African country of Mauritania in April. The company is gearing up to bring a 500kW solar plant to the Polynesian nation of Tonga. It is even pursuing plans to distribute hundreds of solar systems to isolated communities in Afghanistan. More projects are sure to follow; in May, Masdar partnered with the International Finance Corporation -- the private arm of the World Bank -- to develop $1.5 billion worth of sustainable energy products for global clients. While the Port Victoria Wind Farm is just one page in the UAE’s growing portfolio, most would argue that it is a significant and positive development for the Seychelles. But a broader view shows the Seychelles is still in big trouble; climate change is affecting the archipelago in more ways than one. The Indian Ocean is heating up -- more quickly than the Atlantic and the Pacific -- and the rising temperatures are killing coral reefs that prevent erosion. As a result, the sea is chipping away at the islands’ borders and quite literally swallowing the Seychelles alive. The most dire estimates have the tropical islands mostly underwater by the end of this century. It will be up to larger industrialized nations to curb the large-scale emissions that cause the biggest problems. Slow progress on that front has been a source of frustration to Seychelles officials for years. Eight spinning turbines will help the Seychelles to bolster its economy, but solving the bigger environmental problem is simply beyond the archipelago’s capabilities. The UAE is a useful partner to the country, as it is to a slew of developing nations scattered around the globe. But without more cooperation from other power players, change may not come soon enough.